Last edited by panos on 2014-11-05, 13:05, edited 2 times in total. You've given me an idea for my Pale Moon look. Thanks for posting the screenshot of your's. Mine, I like minimalist as well. reosjenkeri wrote: plae moon is not looking good. 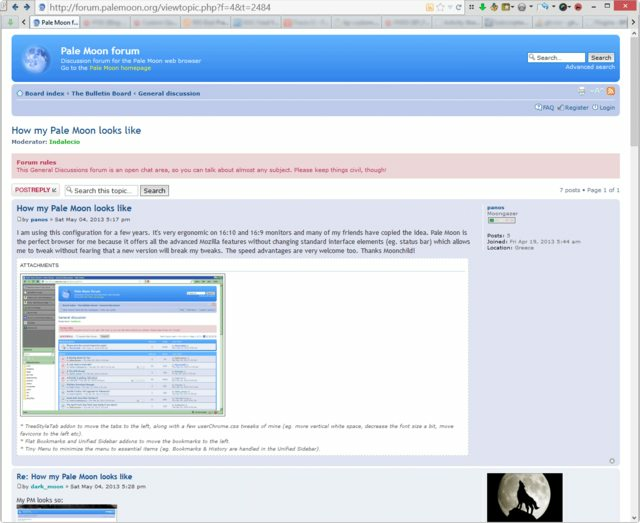 You are using Pale Moon 3.6. * - I strongly recommend you upgrade. The start page listed is absolutely ancient - is this an old screenshot? I like how eventually Firefox will be incapable of providing me a useable browsing experience. Pale Moon is my last refuge agents the on coming storm. Anything I can do to help the project and support it, I will do! The blurred tabs were done after the screenshot was taken. • "Tiny Menu" saves a good amount of horizontal space without having to outright disable the Menu bar. • I choose to auto-hide the taskbar and keep it left-aligned. This saves space and a left/right-alignment offers way more space for programs, without them becoming thinned out when many are open. A larger resolution (I'm dying for a nice 1920x1200) would allow it to better stay viewable, but you have to do what you can with the pixels you have. • My Windows 7 x64 system 'idles' at 500-600MB memory while I have 2.5GB installed (my Pale Moon sessions eat this like it's candy). I use Windows Classic themes, uncheck everything in "Adjust the appearance and performance of Windows", have unnecessary Services disabled (careful here) and minimal programs opening on startup. Highly recommended. Don't be like me - having well over 100 tabs all the time without a well-optimized Windows system or an excess of resources can be asking for serious hangs.. Many years of customizations. Lots of css work done on it through stylish and help of others on userstyles.org. One main thing are how my tabs operate, seen in second screenshot. After so many tabs opened "3" they collapse on both ends if I switch tabs to the right or left. So, if I am on tab 4, you can see it on the first screenshot ect. Lots and lots of color customizations, as you may see in second screen shot, I got a badass orange fading to grey for my bookmarks background. Tabs, bars, headers,scrollbar,addonbar,urlbar ect. It's banged out. It is compact and sleek for best screen space. The theme I am using is as well customized through about:config settings, like placement of tabs almost going over the window border, they can be dropped, enhanced, raised passed the border. Imho, it's just badass for my liking. My Pale Moon looks rather...pale. I think it needs chicken soup and its temperature checked. Okay, here's what it looks like. Oh! I like that! Very useful looking! Congrats! Last edited by JBGood on 2014-02-02, 23:20, edited 1 time in total. Here's mine. No tabs & custom titlebar. This is my brand new 64-bit linux version of Pale Moon 24.3.1 running in the debian based SolydX 64-bit linux operating system. Of course, I'm running Pale Moon from the executable file since I'm terminal illiterate. Last edited by Night Wing on 2014-02-03, 00:53, edited 1 time in total. Looks really great Night Wing! I've toyed with a couple Linux distros over the years. If they could get Autocad and Quicken to run, I'd probably ditch Windoze, but until then, Windoze 7 until ?? ?